Upgrading to APR Stage 2 yielded great results, but the free-flowing downpipe also introduced a prominent drone, starting at 2800 rpm, even with an otherwise-factory exhaust system. At cruising speeds below 2800 rpm, the car sounded just as it did when it was new and stock. But the exhaust note would easily double in amplitude the instant the engine reached 2800 rpm. It’s not often that I cruise at 3000 rpm. But I sometimes find myself accelerating gently, perhaps being too lazy to shift since I know I’m about to slow down again, and my engine speed is hovering between 2800 and 3200 rpm, right where the drone can be most annoying. “Annoying” is a rather harsh term to describe my drone because it’s really not that bad. Still, I was happy to learn that I could eliminate or reduce it by replacing the factory front muffler/resonator with a different resonator. 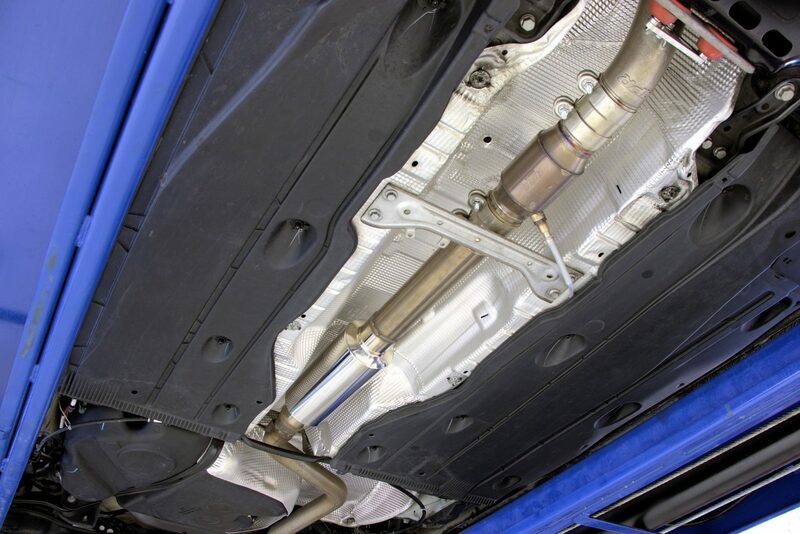 A GolfMk7.com forum user named “GTI jake” created a popular exhaust system topic about “how to get the sound you want.” Jake is the proprietor of Baun Performance, which specializes in Volkswagen & Audi performance parts installation and fabrication services. The top post in that discussion is a well thought out explanation of how to tame exhaust drone and adjust overall volume. 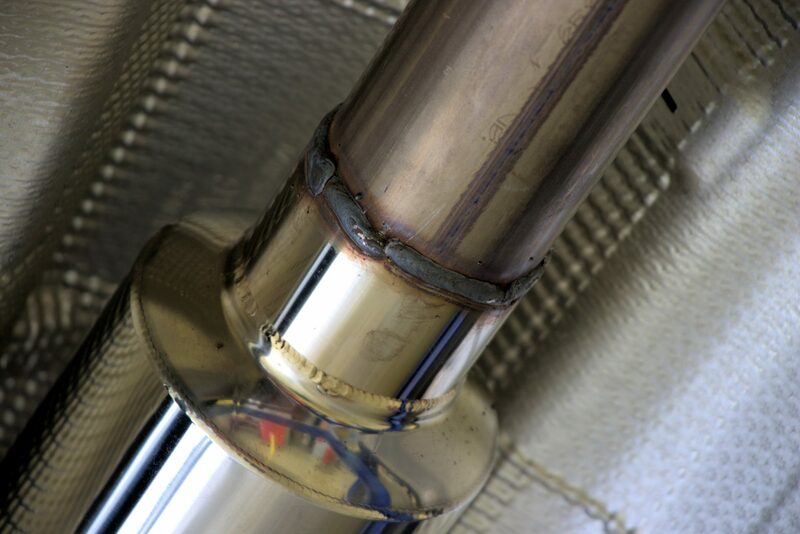 In short, resonators are tuned to attenuate certain frequencies while mufflers are designed to manage the overall volume. 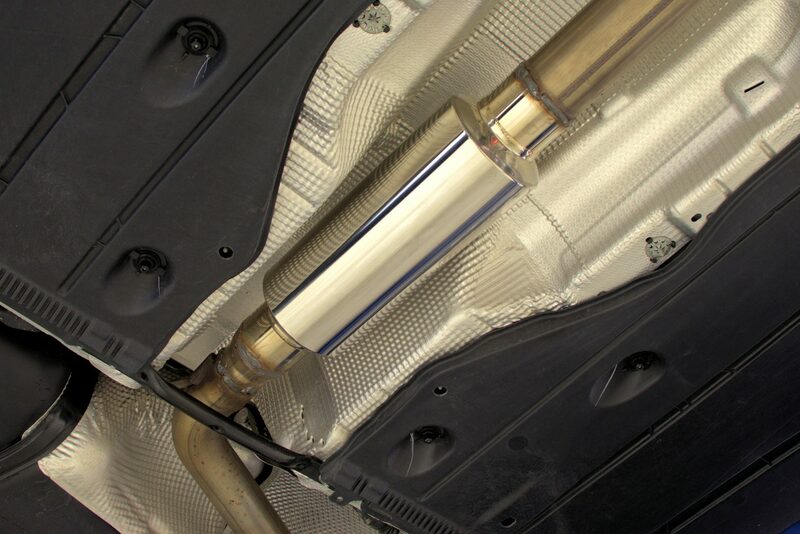 The VW front muffler/resonator was designed to work with the factory downpipe and catalyst. Swapping out the factory downpipe in favor of the APR downpipe drove my wish for a different resonator. Jake’s description was all I needed to make a choice. I chose Vibrant’s 3-inch 17950 over Jake’s recommended 2.5-inch 17930, just in case I decided to finish the rest of the system with 3-inch pipes later. I took my car to Performance Innovations in Hampton, VA for the installation. The Vibrant resonator is shorter than the factory unit, so the shop added some 3-inch stainless steel pipe to fill the space. 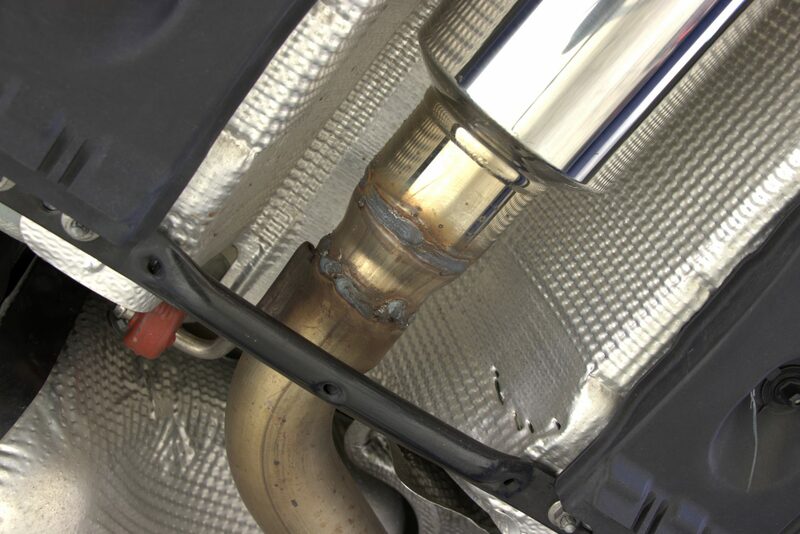 The APR downpipe came with an adapter to connect the 3-inch downpipe to the 2.5-inch factory resonator. I had the shop reuse that adapter to transition the output of the Vibrant resonator to what is left of the factory exhaust. I’ll probably keep the factory muffler until it rusts through, if it ever does. I was eager to hear the car after waiting about an hour. I could hear welding, then I heard the lift lower. I was ready! Then my heart skipped when I heard the horrifying sound of a “fart-can” exhaust car being started. When the mechanic came to invite me to see his work, I learned that the car hadn’t even been lowered to the floor yet. “WHEW!” I guess I had heard a different mechanic working on another car. I took a few photos, then he lowered the car for its first start-up. I was VERY pleased. The car sounded completely stock… or at least substantially quieter than before. I’d have to compare it to a stock GTI to be certain. I drove away and was thrilled to have my quiet rocket back. The drone was nearly gone. I say “nearly” for only one reason: during moderate acceleration, there’s the hint of a drone at 3000 rpm… it’s right in between the effort of “normal” acceleration and “a little more” acceleration. I cannot reproduce it at will; I suppose it depends on the load. Guess what? It doesn’t matter. I don’t think the sound could possibly displease anyone who’s into performance modifications. A “stock-only” purist might notice… maybe. The exhaust sound is only loud when I’m really punching it. Even then, most enthusiasts might not think it’s loud enough. HAHA! I’m happy with it, though, which is all that matters. And the use of the 17950 ensures that I can add a 3-inch muffler system fairly easily in the future. See this YouTube video for my sound comparison. See more photos in the album below. In short, believe the hype! The Vibrant standard 17950 or 17930 resonator, not the “Ultra Quiet” series, WILL curb unwanted drone in our cars with an aftermarket downpipe. At just $77 through Amazon, it is possibly the most effective solution for the money!